The Wild Geese® Exiles Premium Irish Gin has won a Gold medal at The Sprits Masters Series in London. 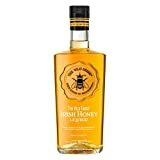 The Exiles is part of a trio of new sprits in The Wild Geese® portfolio, and this gold medal follows hot on the heels of various accolades achieved earlier this year for the Untamed® Irish Vodka and The Wild Geese® Irish Honey Liqueur. The Wild Geese® Collection is available for purchase from the Celtic Whiskey Shop, 27-28 Dawson St, Dublin 2; Dublin, Shannon and Belfast Airport Duty Free, as well as key Duty Free outlets internationally; online via Amazon.co.uk and in other select locations.